Everyone's tired. Its hard hard work having this much fun. I'm not at all in the mood for flying at supersonic speeds along twisty roads...not today. Deep inside there's a part of me that just knows that when the road is clear and the sun is shining, I'll end up winding open the throttle again. It's like an addiction, pointless, dangerous and highly exciting. BigD, who's been sticking with me these last few days, is feeling the same too. We decide that it may be wise to take a day out to actually "see" some of Scotland rather than transform it into a blur of tarmac and green. The first time I came to Scotland it rained...a lot. On one wet and windy day I took some time out with myself and ended up on the strange Island of Luing. It was my own mini-adventure. Remote, wind-swept, cold and very wet, I felt as though I'd fallen off the edge of the world. I'd love to go back, especially on a day like today with the sun shining. BigD decides to ride there with me. I don't know what the rest of the crew has planned, I'm sure it will be fast though. The road from Fort William to Oban is, like most roads here, long and winding. But unlike some of these roads it's a little busier and there are fewer safe overtaking opportunities. Not to worry, I'm here to chill out and see the place, not scream through it. That peaceful thought soon fades though when we get stuck behind a row of caravans and tourists. I wait and look, look and wait until finally a straight stretch of road appears. Damn! There's oncoming traffic too. I wait and look and look and wait again and inside I'm starting to boil. Another straight and CRACK! I slam the throttle sliders into the top of the carb bodies and sure enough I'm back in hyperspace. Damn, it was all going so well. Fortunately nature intervenes. My bladder is fit to burst and at Benderloch I turn off into some side road in the terminally optimistic hope that it will lead me to a nice cafe and toilets. It doesn't but by sheer luck it does take us to a visitor centre that has a Tourist Information point. The nice ladies tell us of a cafe just a few hundred yards further down the main road from where I turned off. We are both pretty desperate now so we nip to the cafe in Benderloch. BigD beats me to the toilet. It seems like he's being deliberately cruel and takes an age in there. By the time I get in I'm almost done for...it could have been a wet ride home. There can surely be no better feeling than finally emptying my bladder. The cafe's a bit of a find! Nice friendly chap on the counter, large pot of tea for me and coffee for BigD, a little cake too. There are a couple of Dutch bikers in too, I try to listen in to their conversation but it's all Dutch to me. We get back onto the road. The main road twists its way down to the Connel Bridge. Here the large metal bridge takes us across the mouth of Loch Etive. On my map I'd noticed a back road, not even a B Road, that cuts out Oban and goes straight from Connel to Kilmore. I doubt I'll find it but by sheer luck I find myself rolling out into the middle of nowhere on single track smooth tarmac. The road is gorgeous. It rolls up and down, left and right through tiny hamlets and farmland, over hillocks and past Loch Nell then opens out to grand views before closing again into trees. It also means we miss any traffic and tourists in Oban, not a bad thing. This back road soon brings us out onto the A816, heading South to Kinliver. At Kinliver I spot the signpost for the B844 that will take us to Luing. More single track, more perfect tarmac, more rolls, twists and turns and the sunshine is warm but not yet uncomfortable. 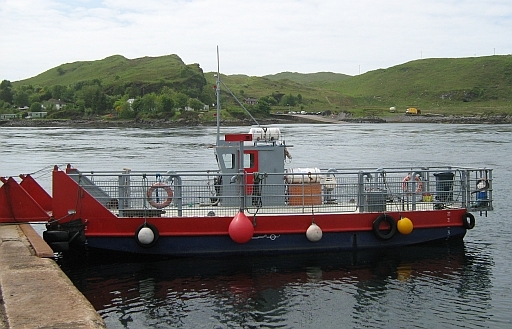 We cross a large humpback bridge onto the island of Seil then along the road we turn off the A816 and follow the sign for the Cuan Ferry. This leads us to the ferry terminal, for want of a better word. What we actually see is a concrete ramp that leads down into a narrow stretch of fast-flowing sea between Seil and Luing. It's barely a couple of hundred metres across and we can clearly see the other side. On our side floats a tiny ferry, large enough for maybe three or four cars. As we look across the fast flowing water this vessel seems somewhat inadequate. At the head of the ramp stands a ramshackle fiberglass cabin, sarcastically signposted as the Luing Ferry waiting room. Inside the seat pads are ripped, the posters on the wall are faded and ripped and the door hangs distortedly from its hinges. The scruffy timetable does however tell us we've over half an hour to wait. BigD and I take pictures and chat to a rather strange family, and a cyclist who's touring the area using the car for the mileage and the bike to look around. We hear stories of kayaking around the islands and "wild camping" from the family's father, but he looks so boringly normal I wonder if he's just bigging himself up. His kids have wandered off, probably sick of hearing the same story. Finally the 2 ferrymen arrive and start the ferry. We board along with 3 other cars and start the crossing after handing over £4.80. The crossing is surprisingly smooth, our only issue is getting off! We can only get off by turning the bikes around in the tight space. The car drivers scowl at us as we shuffle backwards and forwards to complete our turns. They then have to reverse off too. Luing is only a small island. The single road that leads from the ferry ramp runs for about a mile or so before we turn off for Toberonochy. Toberonochy is bigger than I remember it. Last time I saw just a couple of houses between the driving rain, this time there must be...phew...as many as 20 or even 30 houses! They're all painted white as is the tradition in the Highlands and most of them are tiny. It's a different place in the sun. 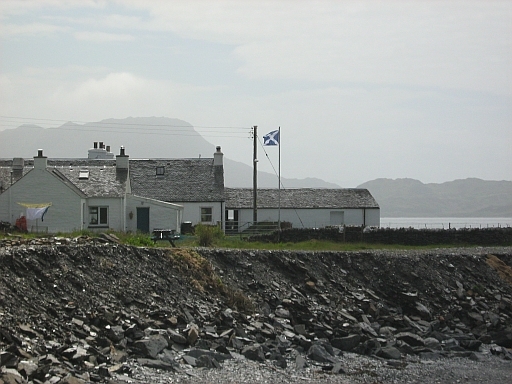 It's cute and picturesque, when it was stormy it was remote and desolate. 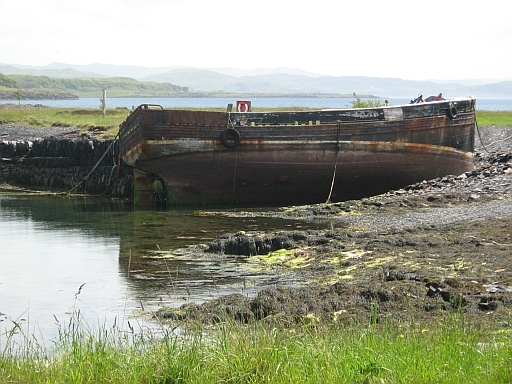 The rusting hulk in Toberonochy Harbour. A quiet and remote place, but beautiful in the sun. We spend some time taking pictures, comment on the rusty hulk in the run-down harbor and imagine how bored the 2 kids must be sat on the remnants of the harbor wall must be. We also notice across the water, looking on the map it must be the Isle of Shuna, a strange large grey structure just off the shoreline. It's large enough and grey enough to be a military ship, but it seems to be more box-shaped than a fighting ship. We try using the zoom on the cameras but to no avail. We'll have to wait until we can see the images on a PC before we can make any sense of it. Other than unidentified objects on the horizon, there's nothing happening here so we leave. We head into Cullipool, a sprawling metropolis of a town compared to Toberonochy. There's no shop in town, that's on the outskirts. There is however a tiny village hall complete with toilets that we both use. There's also a lot of evidence that Cullipool was once a very busy quarry and sheer slate faces stand in memory of this. Now though there are a few rusty diggers here and there and quiet town that's too far from the tourist routes to grow any more. A family prepares lunch on an outside table whilst the kids bounce on a trampoline. More pictures, more comments about the place and then we're off, only a few hundred meters. The Shop is not actually in the town. It's on the road back to the ferry, just outside of town. Being the only shop on the island it's the post office, hardware store, food store and newsagents. There's nothing touristy, no postcards or "I've been to Cullipool" t-shirts. Just the basics, the very basics. With a bottle of pop each we stand and talk of how people can live here. Our town has shops, doctors, leisure centers and all mod-cons. If we run out of almost anything it'll be just a couple of miles away. Imagine needing some rice for tonight's curry. Over a mile's drive, a ferry crossing then another 15 or 20 miles to Oban where the nearest supermarket is. Imagine that. Imagine it's late and the ferry's no longer running. Imagine having a heart attack, you'd need a helicopter. Back at the ferry terminal...or ramp...we meet the cyclist again. We'd passed him once or twice on the road and now we talk to him. The first thing we learn is how to pronounce Luing. I'd called it "Lew-ing" but it seems it's pronounced "Ling". He's from Edinburgh so we compare notes about how it must be to live this remote lifestyle. We're interrupted by the arrival of the small ferry. We follow the B844 back to the main road. 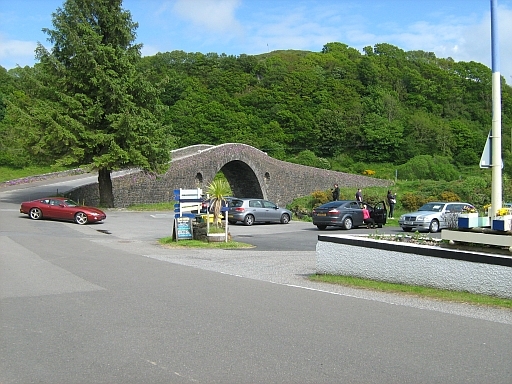 I stop for a moment to get a couple of pictures of the bridge at Tigh-An-Truish. The main road, the A816, drops us quickly back into Oban and we park up alongside the harbor wall. It's quite a change from Cullipool to Oban. 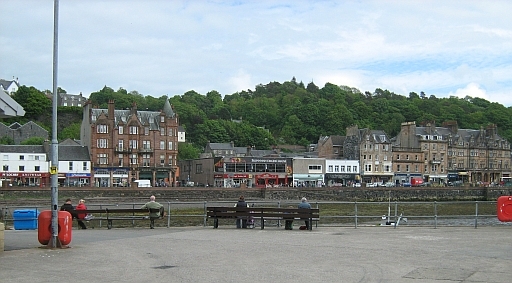 Oban is busy, noisy, bustling and a little too hot. There's tourists and shoppers everywhere, cars, motorcycles, cycles and prams. I think I'd rather be in Toberonochy right now. We walk round the docks in search of food. BigD settles on a chippy meal and I don't bother, I'm not hungry enough for chips just yet. As BigD eats his chips a very bold seagull harasses us and seems impervious to our attempts to scare him off. It's a touristy town is Oban. Oban's OK, but it's nothing special, so I'm glad when we head out again. Our final port of call is the Cafe that overlooks Castle Stalker, at Appin. More tea, more toilets, more pictures and the realization that I'm completely worn out. I'd promised myself at the start of the day that it would be a day of gentle riding and relaxation. As usual though the speeds have risen and another day in that saddle is taking its toll. I'm glad to be back at the BnB now. The Scottish Trip 2010 - The Dalwhinnie and Pitlochry Loop Ren rides out with the boys across the Scottish Highlands. There's a scare, some thrills but more than anything else there's beauty and space in abundance. The Scottish Trip 2010 - Portree And The Kyle Of Lochalsh Loop The Scottish Highlands provide and stunning backdrop to a fabulous ride. The Scottish Trip 2010 - Remote Isle of Luing Luing provides Ren and BigD with a much more sedate and peaceful day's ride than the previous frantic trips. And relax. I originally come from Toberonochy and still have a family holiday house there. 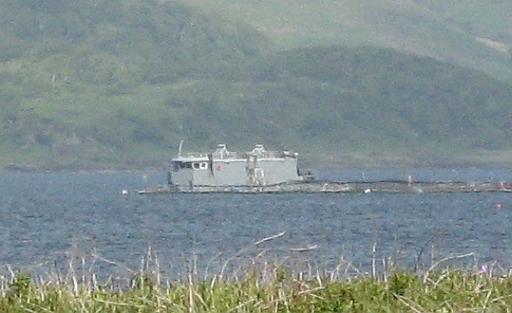 The strange ship type structure in your photograph is part of the fish farm. I`m not 100% sure but believe it is used for storing food and possibly providing power for the automatic feeders and alarm etc. The power of the internet is amazing. BigD and I had thought it was some top secret government facility, a prison ship for people the authorities wanted to "disspear" or the lair of some evil genious with plans to take over the world, James Bond style. If you are a resident of Luing, I will be back whether or not I'm wanted. It's far too beautiful a place. Hi,very interesting to see pictures of the island. I have not been there since I scattered my fathers ashes on my uncle Neil's grave so he is home with his brothers, his father and mother and rests in a beautiful and serene place. Cheers, Neil Brown, Alberta, Canada. Like your wit!! I am always looking for somewhere to go and feed the fish i.e. I go sea fishing occasionally and on the odd occasion actually catch something! I am wondering if the "ferry" to Luing would take my car and boat/trailer. Reversing the combined length of 9M is not one of my specialties so is it practical to go there?